We created a simple and friendly logo for Eco-Seal. The icon highlights the three angles from which they tackle repair and waterproofing. 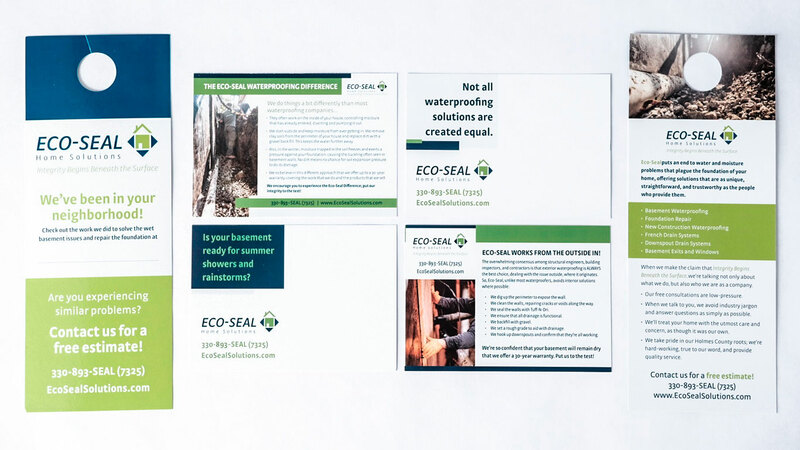 Our friends at Eco-Seal were looking for a way to turn the excellent work they’d done for current clients into more business, so we developed a three-tiered approach that would generate good word-of-mouth in areas where heavy rainfall was already causing leaky basements. 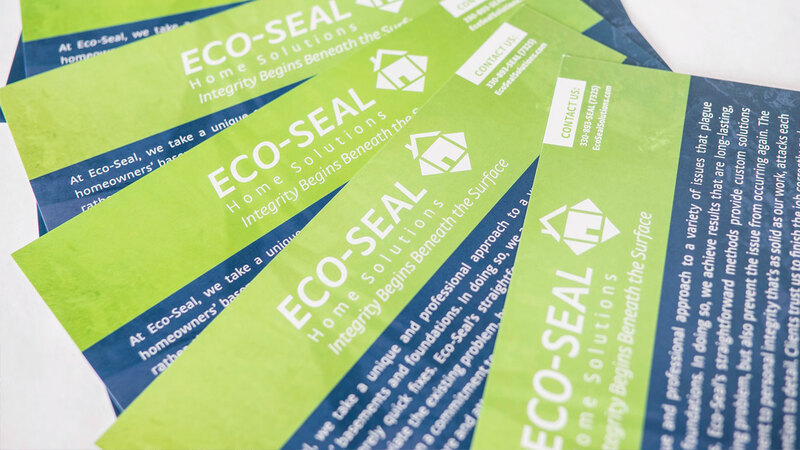 Whenever Eco-Seal completed work on a home, they’d place a sign in the yard advertising their company. 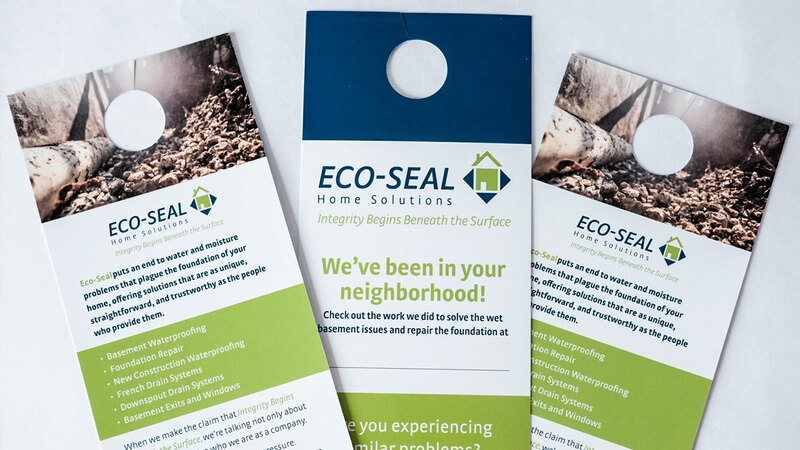 Cassel Bear took this two steps further by arming the Eco-Seal staff with an eye-catching door hanger that could be circulated in the bordering neighborhoods after a job was finished, allowing locals to actually stop by the nearby house and see the finished job. Two weeks following, the Eco-Seal team could then send out a direct mail piece we’d designed to a broader targeted geographic region around the house. After hearing Eco-Seal at least three different times, residents in the area began calling the company for jobs on their own basements and foundation walls. 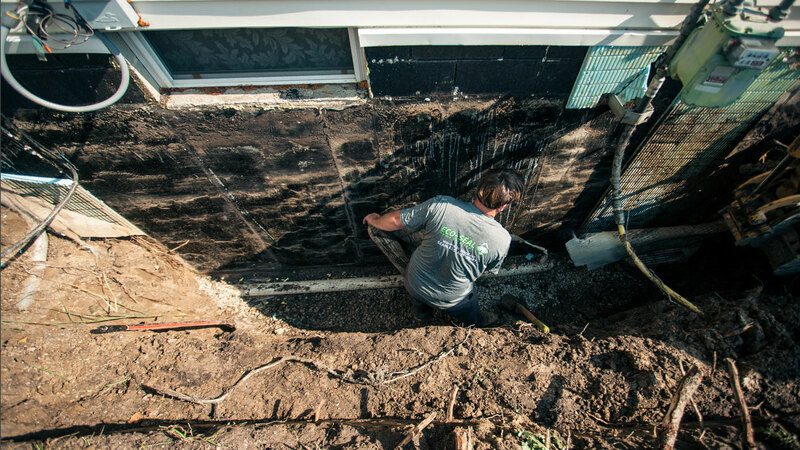 Our friends at Eco-Seal are often called on to perform basement waterproofing or foundation repair when new homes are being constructed or old ones are being renovated. 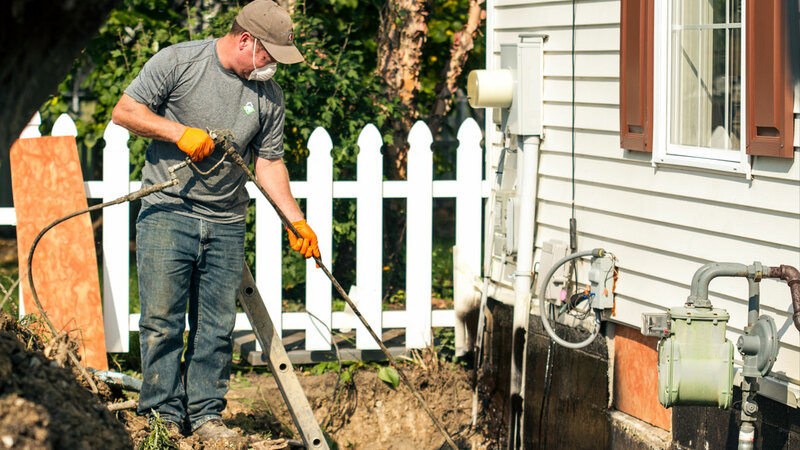 Some of their most significant jobs have them teaming up with general contractors, home builders, and landscaping companies. 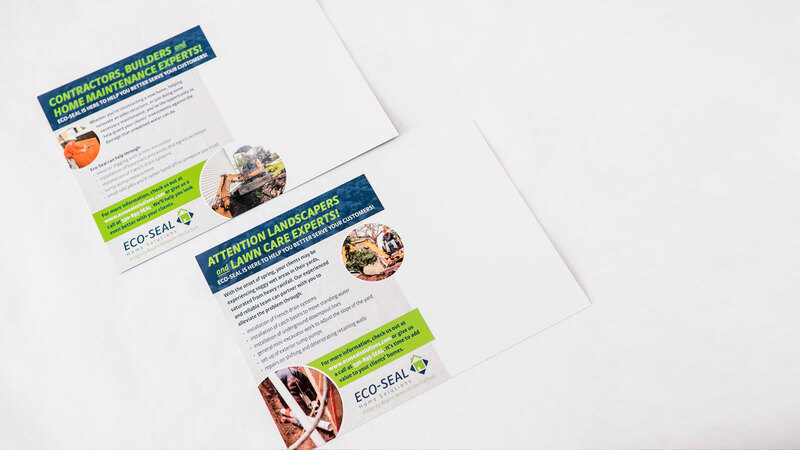 So Cassel Bear joined the Eco-Seal staff to develop a direct mail campaign geared to introduce their capabilities to potential partners in those industries. 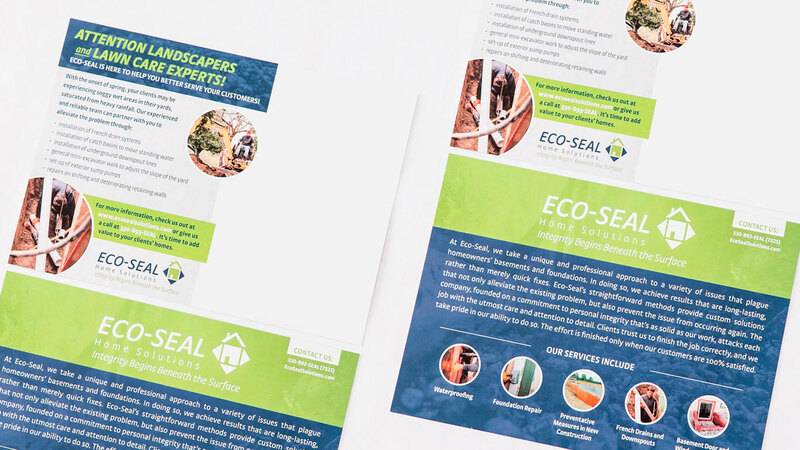 We acquired a list of contractors and landscapers in a four county area and then designed and wrote content for two oversized postcards, each of which outlined how Eco-Seal could help add value to the work they do for clients. As an additional bonus, the cards were mailed out with heavy-duty gloves, branded with the Eco-Seal logo, as a small gift. The sales team then followed up in the weeks after the packages were received. 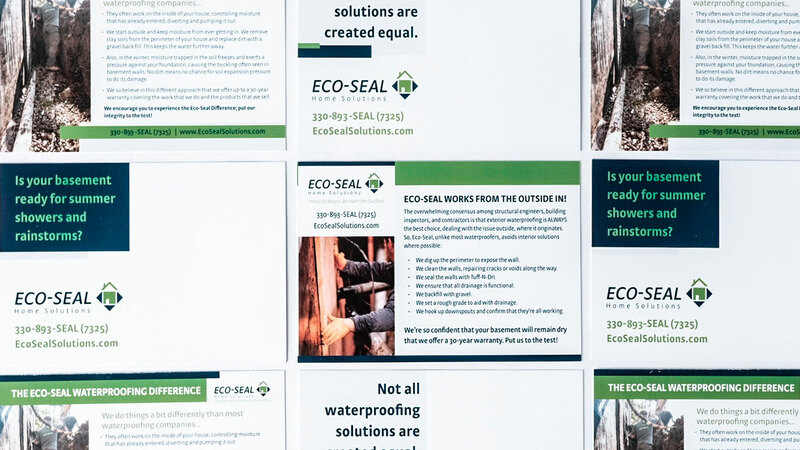 Wet basement, bowing walls, or foundation issues of any kind, Eco-seal takes the long-game approach at solving the issues once and for all. In-action photography supports the wide array of web, brand and print marketing that works in hand-in-hand to educate customers and bring leads to Eco-Seal. Did we get a little bit muddy in the process? You bet. A little dirt never hurt. Video was recently added to the mix to give more information to prospective customers who are intent on solving their foundation problems.